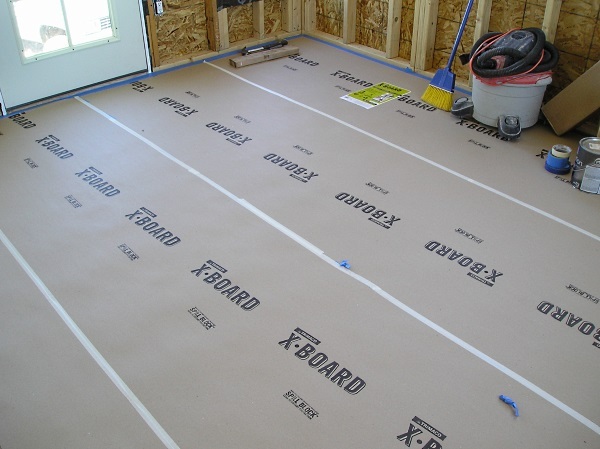 Roll of Trimaco's X-Board floor protector. Builder’s paper and Rosin paper, I don’t have a large need for this type of product but do use it from time to time. Recently I was given the chance to review a 35in x 50ft roll of X-Board by Trimaco. We used it on a ceramic floor in a 12×12 room remodel. Wanted something better than thin paper for this room as it will have to take some extra abuse; protect the floor during the hanging, finishing and painting of the sheet rock and be easy to sweep and/or vacuum. In the past I have used builder’s paper and/or Rosin paper for covering some commercial floors or to protect a deck surface while painting the hand rails. I always try to use a couple layers over hard floors when a scaffold is used, to help protect the surface from scratches and paint spatter. With X-Board what I noticed immediately is the thickness of the paper. It is more like thin cardboard. It is at least 2-3 times thicker than any Rosin or builder’s paper I have ever used. This will provide much better protection from abrasion and be less prone to tearing. A big plus if there is foot traffic to worry about. 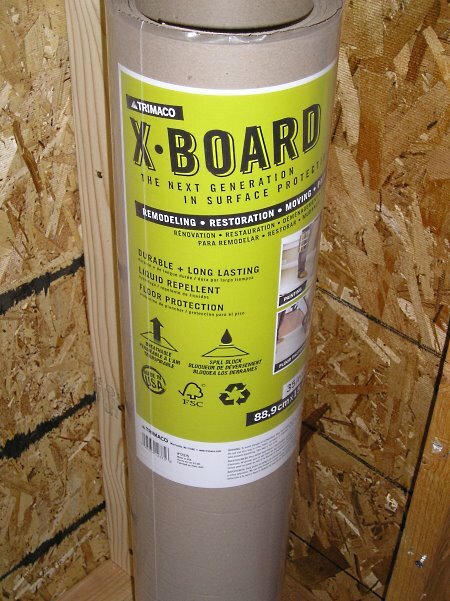 X-Board by Trimaco has several advantages over other brands or types of paper. Thick – Heavy duty, durable and long lasting. These go hand in hand with X-Board. Spill Resistant – Resistant to paints and other liquids. No more worries from spatters or spills. Easy to Use – Rolls out nicely and easy to position. The only disadvantages are it springiness, from its thickness, and price. It is a little more difficult to tape to the floor as it wants to reroll itself but taping isn’t hard. And it is more expensive than thin Rosen paper but that is expected. X-Board is more like cardboard than paper. Plus high quality durable protection will always cost a little bit more. 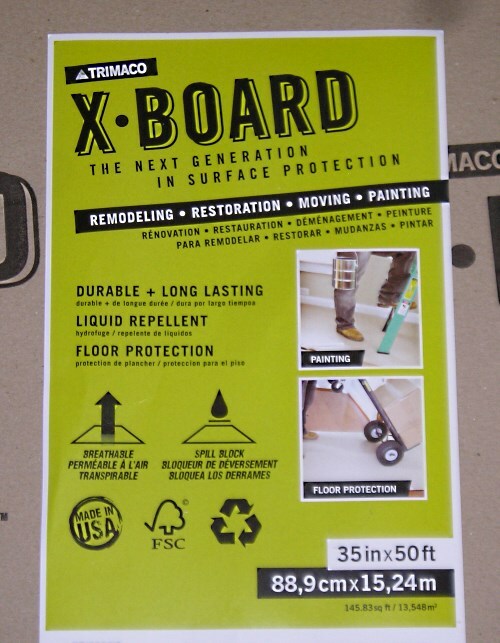 The X-Board used for this review was provided by Trimaco. Check out the Trimaco.com website for more information about their comprehensive selection of painting products.